, any website can offer customized door-to-door directions powered by Google Maps. You no longer need to type and update multiple sets of text directions. Let's face it - customers are only looking for directions from their specific location. The gadget allows you to pre-fill the "To" field with one or multiple addresses, a generic zip code or even a specific set of latitude-longitude coordinates. Customers are able to print their directions with a single click. If they would prefer not to drive, the gadget also provides walking and public transit directions. Take a look at how some organizations like Legoland California, Emeril Lagasse, and Harvard University are using the gadget. Then test and create your own directions gadget here. The gadget is currently available in 23 different languages. For more information on the gadget, visit the Google Lat Long blog. As Google customers, both you and your clients care that people can find you on the Internet. If your clients have one or more physical locations, it's just as important that customers can find them on the map. For example, last week I needed directions to a hotel in Sacramento that I had booked for the 4th of July weekend. As I had never been to Sacramento, I was puzzled by the limited directions on the hotel's site - I had no idea whether I was approaching from the North, South, East or West or where the major highways were. What I needed were step-by-step directions from my exact starting point to the hotel that I could easily print and go. The Google Maps team is excited to tell you about a simple way that you and your clients can add customized directions to your business locations. 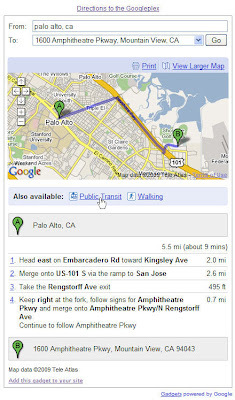 With the Google directions gadget, any website can offer customized door-to-door directions powered by Google Maps. You no longer need to type and update multiple sets of text directions. Let's face it - customers are only looking for directions from their specific location.